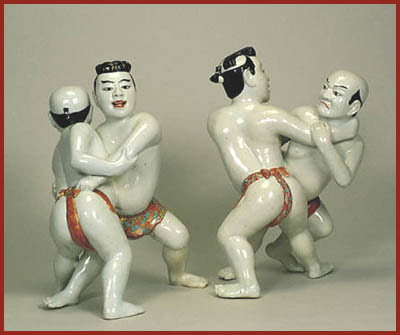 This is a competitive sport where two wrestlers called rikishi face off in a circular area. 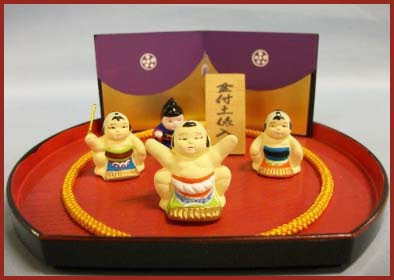 The sport is very popular in Japan and is surrounded by ceremony and ritual.
. WKD : Sumo (相撲, sumō) . 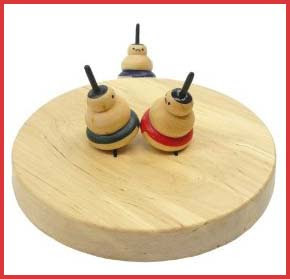 Spinning tops (koma) of sumo wrestlers are quite popular. Click on the image for more photos . Looks like front cover of Gordan Langs wrestling boys book. Listed in an inventory dated 1688 from Burghley house. Although slightly different pose. 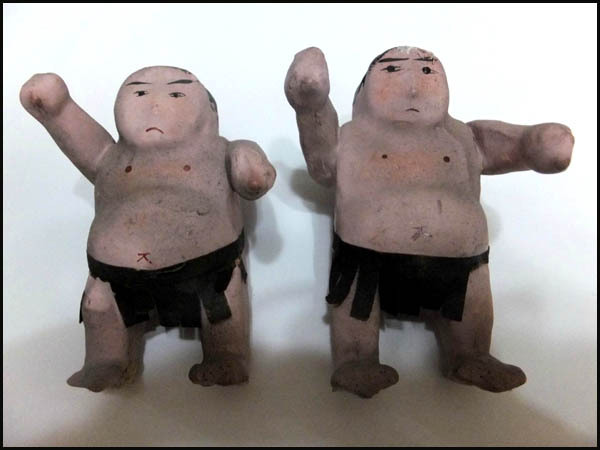 Described as Kakiemon-style group of wrestlers, and dates them between 1670-85.
. akamono, aka mono 赤もの red things (for good luck) .
. 東郷人形 Togo ningyo dolls - Rikishi .
. ita sumoo 板相撲 sumo wrestling on a bord . 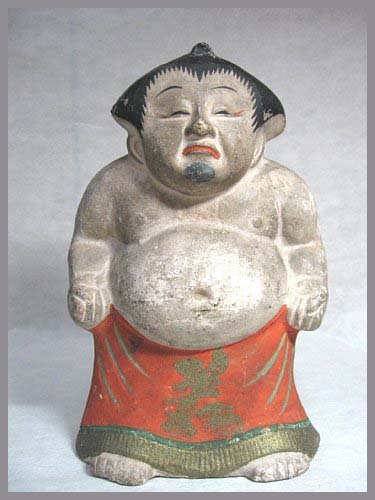 There are some famous sumo wrestlers from Miyagi, one of them was Hideynoyama Raigoroo 秀の山雷五郎 , born in the year 18808. 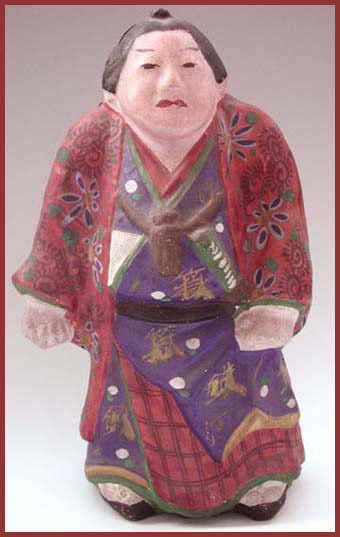 At the age of 16 he went to Edo, first under the name of "Northern Mountain", Kitayama 北山 as Ozeki in 1841. Later in 1845 he changed his hame to Raigoro. 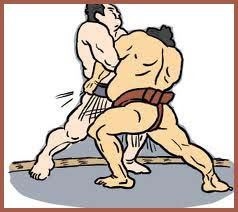 At the age of 39 he became the 9th Yokozuna.
. Tanikaze Kajinosuke 谷風梶之助 from Mutsu 陸奥 . 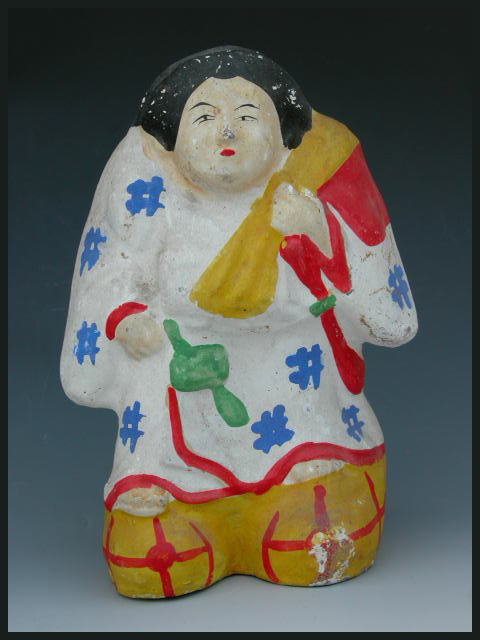 Sumo wrestler, 1750 - 1795.
. Kesennuma ningyoo 気仙沼人形 toys, dolls and kites from Kesennuma . 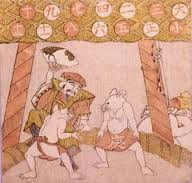 In this kind of contest, children under one year are brought to the arena, held by a rikishi, and who starts to cry first will loose the bout. Parents bring their little boys (and now even girls) to wish for a healthy upbringing of their children. 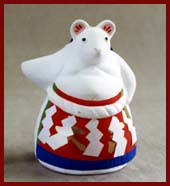 The little mouse of the home of Grandfather and the big mouse in the home of a rich elder in a small village in Okayama performed sumo wrestling. But the little mouse was weak and could not win. 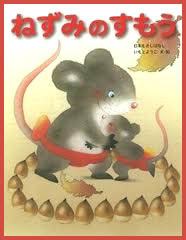 So Grandfather fed the little mouse delicious fattening rice cakes to make it stronger. 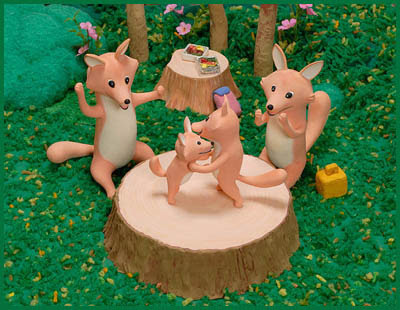 The big mouse got envious and came to feed also, and the gentle Grandfather gave it some light rice cakes too. Later the big mouse brought some money to the home of Grandfather as a thank-you gift for his generosity. And thus he became rich and happy too. This is a well-loved legend in Okayama and subject to paintings and children's books. Here we have the deity Daikoku sama as referee. 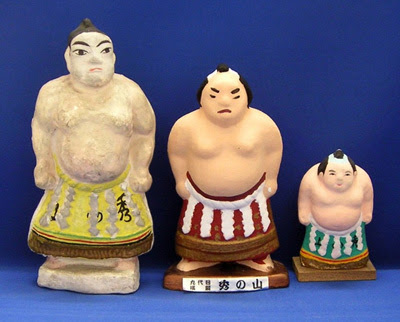 Since the Meiji period, Sumo had become quite popular in Osaka and there dolls soon were a favorite souvenir. 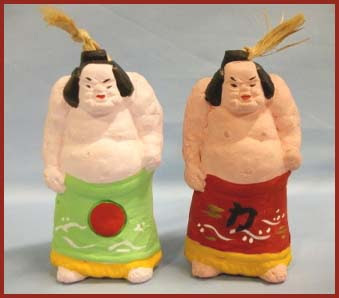 They were also made from clay, usually two as a pair fighting a bout. They were about 12 cm high. 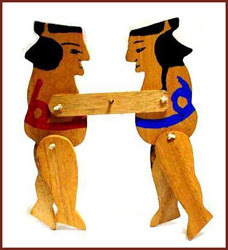 Two figures were bound together with a string, to be hung from the eaves of stalls during festivals. 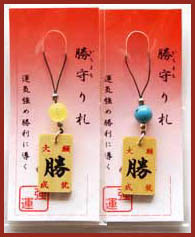 This ema is an amulet for good health, strong legs and a steady heart and mind. A fox who lived nearby changed his appearance to a samurai and called himself "Kakibe" 民部. The fox wanted company and went to a nearby temple, invited a young monk to his home and started talking to him all night long most of the evenings. "You are always so late at night, where do you go?" "I visit a nearby Samurai called Kakibe"." But the priest knew there was no house nearby, so he became suspicious. "Please ask the samurai to come here and let me give my thanks to him," he suggested one day. So the next evening the young monk brought Kakibe over to the temple. The priest was very hospitable and soon he offered sake to Kakibe. The temple was a quiet place in the forest, surrounded by beautiful flowers, and for some reason the talk was about sumo wrestling. "Maybe we can do some sumo here tonight!" The young monk and the priest were very eager to test the strength of the samurai Kakibe. And so they did. When the young monk cleaned the garden next day, he found the hairs of a fox in the place where they had wrestled the night before. He brought them to the old priest. "Well, just as I thought" he mused. "But he seems to be a good fellow, so let us go see him tomorrow again." 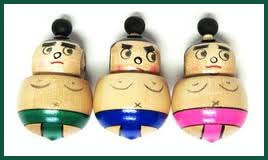 "Now that we have become good friends, even doing some sumo together, I have to tell you, I have to move away from here and go to a place in Kawagoe, called Bonshinsan 梵心山. To show you my gratitude, I will teach you how to cure a bruise on the body."
. . . and then he left. 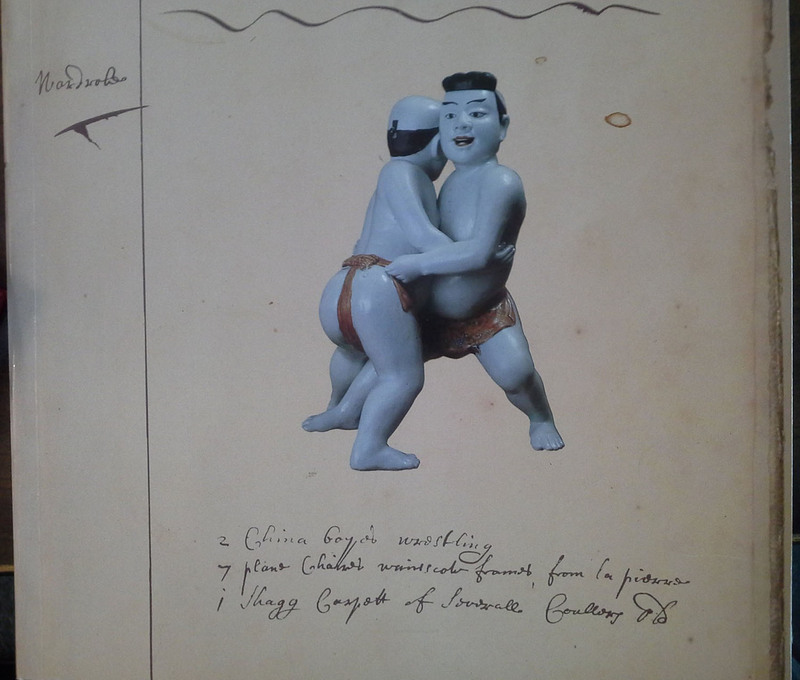 and a votive tablet with the sumo is sold there. A kami of foodstuffs, thought to refer specifically to the spirit of rice. Kojiki describes the kami as the offspring of Susanoo, while Nihongi states that it was the offspring of the two kami Izanagi and Izanami. The Engishiki's comments on the Ōtono no hogai norito further identify the kami with Toyoukehime. Ukanomitama is most commonly known as the kami Inari. 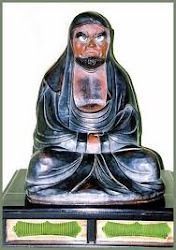 From the medieval period, the kami was linked to popular combinatory kami such as Ugajin and Uka Benzaiten. 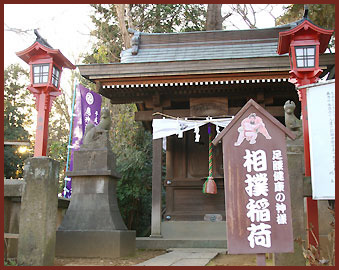 Ukanomitama is enshrined at Kyoto's Fushimi Inari Taisha and other Inari shrines throughout Japan.
. Hachiman Shrines of Japan - 八幡宮 .
. Inari 稲荷 the Fox Deity Amulets .
. Amulets for Sports and Martial Arts . Once upon a long time ago, in the village of 小栗村 Ogurimura in 諌早 Isahaya (長崎県 Nagasaki) there lived a farmer couple who did not have children. They went to mount 八天嶽 Hattendake to pray. And then a Tengu came at night . . . well well, the woman got pregnant and bore a strong son. 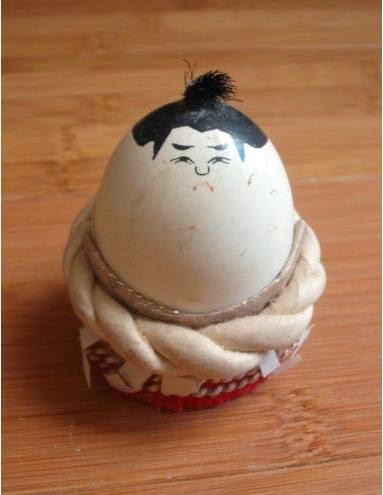 The boy named Taizo became a strong Sumo wrestler. The Tengu trained him the best he could. Taizo won all the bouts in his village. Taizo eventually went to Edo and nobody could defeat him. Taizo almost won against the strongest Sumo wrestler in Edo, 鬼ヶ岳 Onigadake, but Onigadake had asked him to let him win, so Taizo lost this one bout (and thus his Tengu power) and then all the other bouts after that and went home much ashamed. 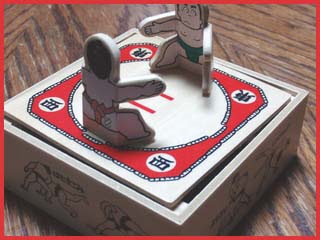 Sometimes the villagers could hear a boulder (ゴットン石 Gotton Ishi) rumble at Mount Hattendake, where Taizo was practicing Sumo with al his former might. He could lift the boulder and carry it to the summit in no time. At the place where the Tengu used to practise sumo wrestling, a Tengu once had his long nose come off. It turned into the flower of 水バショウ Mizubasho, skunk cabbage.